Antiques challenge. 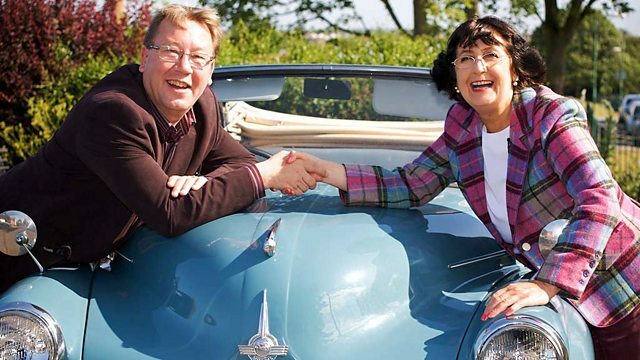 It's the second leg for antique hunters Philip Serrell and Natasha Raskin as they take in the delights of south Wales before heading to an auction in Newent. HORN BEEPS With £200 each, a classic car and a goal to scour Britain for antiques. with dynamic duo Natasha Raskin and Philip Serrell. -I think we're a good match, do you know that? Do you get tired being happy all the time? No, but do you know what I think you're doing? You're kind of chilling me out a little bit. with a reputation for being a bit of an old grump. -Have you got any idea where we are? -You don't have any idea where were going to? Newport, we're in Newport and we are heading for Newport. I don't want to be picky but this is not Newport. Let's just establish roles here. who specialises in Scottish contemporary art. Wales in a gorgeous Porsche with a handsome man like you. -Oh, what a girl, what a girl. I'm so glad you've memorised that script I gave you. in a classy 1957 Porsche 356 Coupe. -this is the car I want to take home with me. Natasha made a loss on the last leg. she's ended up with £161.96 to play with. and made a great profit, so he has £275.90 to spend today. What are you going to be looking for today? slightly smaller, slightly more feminine this time. Just buy five totally different things. before finishing up in Salisbury, Wiltshire. and will meander its way north towards the auction in Newent. Nothing like a relaxing drive in the British countryside, eh? -Oh, Lord. Have we got to go on that? -I think we might have to! -You're joking. I do not fancy that at all. What? That thing hanging out of the sky? That thing is the Newport Transporter Bridge. with only six operational transporter bridges worldwide. -This is a bit exciting. -It depends on what you deem is exciting. up to the high-level walkway at the top of the structure. -It's moving. It's moving, it's moving, it's moving. -Are you not enjoying this? -No, I don't. I don't like this one little bit. -Cos I don't like stuff like this. as Natasha's heading to her first pit stop. -Oh, hello. Hi, there. I'm Natasha. This looks like an absolute treasure trove of a shop. I don't really know where to start. There's so much everywhere. There are... I can't help but look up, cos there are so many pictures. I can't stop looking up, but I don't think we're going to look at pictures today. Look at stuff, look at stuff. Stuff, eh? Plenty of that in here. Oh. How excit... Oh, a Beswick. I do know the name Beswick, of course, because everyone does. It's probably 1970s. But it's in the form of a pheasant. It's probably for keeping eggs. come on, he's got to be a winner. and I wonder what would be your best price on the pheasant terrine? -I'll be sweet to you, a tenner. that I've just clocked as we walked past. which were primarily used to carry acids. -but it's, I guess, a sort of molden glass. It wouldn't be blown, would it? but they're so decorative, aren't they? You can do anything with those. It would have been an acid holder, wouldn't it? Oh, really? I think it's a lovely lot. And I'm thinking... I haven't even seen the price. OK, so it got £28 on it. I really like the two. I think they're totally bizarre and disparate. -But, at the top end, their combined price was £43. Would you be open to an offer of £30? -Yeah, go on. It's near enough. I'm going to grab your hand and go with it. So, with two lots bought, Natasha's off to a flying start. to the Welsh capital, Cardiff. Cardiff also clocks up more hours sunlight then Milan. Surely that'll brighten up Phil's day? I'm, sort of, loathe to admit this, but I do really like Wales. but I think Wales is... I love it. I really do. but enough of the love-in, you've got some shopping to do. -I'm good, thank you. Welcome to The Pumping Station. -You've got a massive place here, haven't you? with more than 35 different traders all under one roof. -How are you, good Sir? Are you well? -I'm good, young man, yourself? Young man? I'm warming to you already. Hey, Phil's not been a young man for a long time. But, what's this he's spotted? -Can I have a look at the group of them, please? It's a collection of 19th-century intaglio metal moulds and glass seals. Intaglios are designs or images that are cut into hard surfaces such as metal or stone. as sophisticated keepsakes of classical antiquity. and you opened the books out and the books would be full of intaglios. Phil's clearly interested, but can he strike a bargain? What would you take for those and what would you take those? That's for all of it? See, I'm miles away from you on price. I've really got to try and get these under 30 quid. Could 25 quid buy them? -Oh, you're an absolute gentleman. Thank you ever so much. So, a generous discount there from Paul has secured Phil his first purchase. Anything else float your boat? Oh, this is a little watercolour. It's of HMS Tidepool, which, one presumes, is that there. I just think it's a really interesting little watercolour. but there's a great deal of depth to it. The ticket price is £28, but can Phil convince dealer David to take less? which means I've got to try and buy it for between 10 and £15. -Well, I'm going to shock you. -I'm going to shock you. You can have it for £14 and that's my final offer. -You're a gentleman. Thank you very much indeed. with both of them bagging two lots each in their first shops. and has come to its indoor flea market for a scratch about. I think, actually, I want to find something vintage and retro. It's got that look, doesn't it? That has to be the most ridiculous thing I've ever seen. Planter, plant... 1970s tiger plant pot. I'll probably put this one down and move on. Yes, something a little less garish might be best. There's one thing I really like. It is quite unusual. It's this little coral and seed pearl brooch. What's going on with that? I don't have a clue what the motif is. Well, it is a riding crop. And the horseshoe is to represent hunting and all that sort of thing. -Seed pearls and coral, is that right? Is this in nine carat gold? No... I still haven't found a mark on it. -So I think it is gilded. -I'm not pricing it as nine carat gold. What is your price on that then? I will do for £25 for you. It wouldn't be right if I didn't counter offer you. What if I said £20? What if I said that, what would you do? -£20. You're OK with £20. -Can we shake on it? That's excellent. Thank you so much. I think that is really cute. executed painting of what I am guessing would be the artist's father. it is just a nice memory she has had that she's wanted to reproduce. It is just a lovely thing. the painting for under the £50 ticket price? -I can probably do it for 40. Oh, Pete. 40 quid, you reckon? You aren't going to mug me now, are you? I am not going to mug you, but here is what I'm going to do. I will lay my cards on the table. I was hoping that Peter, Pete, you would offer it to me for £20. -That is ludicrous, isn't it? -What do you reckon? Am I being too cheeky? -No, go on, you can have it. Oh, Pete, you're such a star. Thank you so much. Oh, my goodness. Come on! He is so cute. He is everyone's best friend. -And you are now mine! -Aw, another great deal done securing the painting for £20. She is off to a strong start. Phil, meanwhile, has taken a 20-mile trek west to Bridgend. and after the war, and it was the site of an infamous daring escape. Brett Exton to find out more. -Hi, Phil. How are we doing? -This is an interesting building. This is hut number nine of a prisoner of war camp. -German prisoner of war camp. Not a very big one, by the looks of it. Oh, it was huge. Yeah, yeah. There would have been another 30 huts. -Oh, not just this bit then. -No, not just this one! This is all that remains. the camp closer to how it would have looked during the war. -Wow, so this is our cell. We are the Germans and this is our cell. -What did we do? That is clearly where we slept. but we would have had to find things to amuse ourselves. we would have made things, we would have crafted little things, toys. they would have gone stir crazy. they drew some very intricate pictures. some of which are rather racy and there was a reason for this. the secret tunnel the prisoners were digging. making it the largest escape from any POW camp in Great Britain. How did they know where they were? Because, you know, you're in the middle of Bridgend. You wouldn't know if you are in Bridgend or Bournemouth, would you? Well, the British military had been quite ingenious. "what can we do to make things a bit difficult for them?" the very train that brought the Germans here back in November 1944.
their handkerchief and onto the tail pieces of their shirts. -This really is Colditz in reverse! from Hut 9 out to freedom on the other side of the fence. feet in a curved shape underneath this path. and then, in length totally, about 30 feet in total. -And, I mean, that is an engineering feat. Vorsprung durch Technik, they say. And the tunnel is still standing today, 70 years on. -It has never collapsed after all this time. -How did they do it? But what's the interesting thing is how they shored the tunnel up. and that is what they used to shore the side walls of the tunnel. What did they do about losing all the soil? they extended the wall with plasterboard. -They made a dummy wall. -Yeah, to make a false wall. but what they did have was a plentiful supply of porridge. and that is what they used to glue the wall together. and that is a joke at the expense of the guards. of hard labour were to end up in vain. were recaptured and imprisoned once more. did all the soldiers go home or did some of them stay? Well, some of them settled down in the area. and settled down locally in Bridgend. That's fantastic, isn't it? A really good story. This is very much part of Bridgend's history, isn't it? see preserved, and hence why this is a Grade II listed building today. It isn't the prettiest Grade II listed building I've ever seen! Brett, you have been a star. Thank you for sharing. Thank you. You had better make your escape, I think! -Not by tunnel. By Porsche! It has been a busy day all round. It's time for our weary experts to head off for some well-earned rest. It's the start of a brand-new day. Natasha and Phil are back on the road enjoying the scenery. when you see lambs gambolling around fields? Mint sauce, new potatoes, don't you? -Phil, you're a cruel, hard man. -A wee lamb gambolling on to your plate. He still has a healthy £236.90 available to spend. While Natasha's storming ahead on the buying front. leaving her £91.96 to play with today. -Are you really pleased with your buys yesterday? They got better as the day went on, I do believe. -I have spent £70 in total. How many items have you bought? I was going to scold you for having got three or four. -Have a really good day. -No, I will try hard not to. Flash some of your cash! Ha-ha. Bye! with an eclectic range of collectables set over two floors. There's two quite nice wine labels that might be worth a look at. the collar of the decanter or the bottle that told you what it was. They actually did one for Worcester sauce. I've been looking for one of those for about ten years. It's just sherry and champagne that dealer Andy has on the menu today. and it's silver. Hallmarked London. is twice the price of that one, isn't it? so the label's more expensive. -Can't fault his logic, can you? The ticket price on the cheaper sherry label is a hefty £136. Can there be much movement on the price on that? Normally...probably get away with about 100. -Abnormally, might drop down below 100 for you. It's a possibility. Can I leave that one out? Anything else take your fancy? This is just a really cool thing, isn't it? This is a stationary engine. And you've got the...steam engine here. ..that punt there, like that. I think that's a real good bit of fun. Could there be a bit of movement in the price on that one as well? and £136 on the sherry label, what kind of deal can Phil work, eh? What would be the best you could do on each of those? -I don't know what to do! for £90, I'd have them both of you. -Do it for £90 and I'll have a deal with you. That very generous deal bags Phil another two lots. in the Cotswolds - Snowshill. She's come to visit Snowshill Manor. attracted both the famous and royalty. -Hello. Hi, there. You must be Sue. Hi, Tasha. Lovely to meet you. Thank you very much for having me along. -This is the collection of Charles Wade, is that right? chose to house his collection of around 22,000 objects. craftsman and most famously a collector. mechanical oddities another bizarre items. So this is our first port of call. This room is called Zenith. -I was just about to say. This is a stunning lacquered cabinet. So from when does this date, do you think? And my eyes are darting around because it's quite a collection. or are these grandma's curios? -when Charles was a child, so these were granny's curios. And she only opened this cabinet on Sundays, so it was quite a ritual. that made Charles want to be a collector. and wonderful items, most of which he surprisingly uncovered in the UK. that I just would never believe you that he purchased it here in the UK. Is there anything of that ilk? of samurai armour, you'll find that pretty amazing. The 26 suits date from the 17th to the 19th centuries. I'm speechless and a little bit terrified. of samurai suits in the UK?! about where he found some of the suits. and he went in and there was a suit of samurai armour. "there's a whole load underneath the tarpaulin in the yard." really laid out almost as scrap. And he was able to buy them for quite a small sum of money. that he had a set motto, as it were, three words, "let nothing perish"? Yes, indeed. That was what he said. His own motto. was thrown off and to see these things lying on the floor. He must have thought, "They're perishing! I can save these!" Absolutely. And that's what he loved to do. and spent many hours working on them. Charles' motto also applied to the manor itself. he spent three years restoring it to its former glory. who turned out to be one of Charles' few unhappy house guests. and they'd all chime at different times. Oh, not Virginia's cup of tea? so not a happy weekend. and, in 1951, the estate was passed to the National Trust. Charles sadly took ill and passed away in a nearby hospital. So his life came full circle. He was back in the manor that he loved and had created. Yeah, well, he had a very busy life and a seriously interesting one. to learn about Charles Wade and his fabulous legacy. Thank you so much for showing me around. That's what Charles Wade would have wanted. will continue to live on at Snowshill Manor. of William Shakespeare - Stratford-upon-Avon. and into Henley Street Antiques to meet owner Steve. I'm definitely going to buy something off you. I don't mind what it is, you've got lots of really good stock. for a long time that you need to get rid of. -You're looking for a bargain. Nothing like cutting to the chase, eh, Phil? That's looking like it's tried to be Mr Chip 'n' Dale? -And how much could that come for? it will make more money than this, which is really just good quality. If you like brown furniture, it's fantastic value at the moment. I think that's a nice thing, Steve, I do. There's a bit more brown at the back in the form of a settle. Now this is made out of oak, isn't it? things that have been nibbled by a bit of worm. So, is it worth the £175 ticket price? shove your little pinkie, that is a problem. Your little pinkie shouldn't go there. -Best to have a word with Steve, eh? which has got more leeway, this or the chest of drawers? Tiny more margin on this maybe. Best on the chest of drawers could be 150. Perhaps one last look at the chest of drawers will help decide. -So the death on this is 150. -Can we split it and do 130? -130, yep, let's do it. You're a gentleman, thank you. Deal done on the damaged oak settle. Sold for a pricy £130, but has Phil bitten off more than he can chew? and not in the poor house. Hm. Only time will tell, Phil. so she's made her way to the pretty town of Deddington. She's on the hunt for one last lot at Deddington Antiques. There's certainly plenty to choose from, Natasha. Seems to be quite expensive, this shop. I really need to spot the sleeper and I really need to do it fast. Well, you've only got £91.96 to play with. Better ask owner Brenda for a helping hand. OK. Now you say you've got a piece of Beswick. It's in the form of a pheasant. It's for eggs. -Would you like a penguin? -Sort of because they're very saleable, aren't they? -This little feathered friend is priced at £33. -so we're talking about 1970s. -Is he holding a cane? Big Daddy - that's what I call Phil. Does Phil know you call him that? and it's always good to go outwith your comfort zone, isn't it? Again, it all depends on how much money you've got. -They are pretty cool, aren't they? Ah, but with a £58 price tag, are the piggies worth a punt? But I think I prefer the pigs. And I think Philip will be devastated you've got the piggies. -Yes. I think he'll be so jealous. What if I offered you £25? What if you offered me £35? What if I offered you 30? -This is fun, isn't it? -Oh, go on, then, Brenda. -Nice bit of negotiation there, girls. -Do you know what Phil told me to do? -He told me to buy something I loved. -Yeah. Do you love it? When you brought that out, I thought, "That's the one." What? You say Phil when you saw this?! And, with that, they're all bought up. the oil painting and the coral and seed pearl broach. That little lot cost her £102. the watercolour and the costly oak settle. He spend a mighty £259 in total. This is going to be the battle of the late 20th-century paintings. I've gone oil, Phil's gone watercolour. They couldn't be more different, but I think that Phil has won a watch. At £14, that watercolour is stunning. What I absolutely love is that portrait. and I think that's absolutely lovely. he's determined to shoot himself in the foot, but guess what? I'm going to predict it's going to be his star lot. I really love that settle. I think the patenation on it is absolutely fantastic. The problem for me is the woodworm. Have you seen the size of those holes? Those woodworm, they must be this big! hurtling towards the auction in Newent in Gloucestershire. And I'm wearing my lucky tartan. but I thought that might be a bit much. I was going to wear mine. Black death. Oh, dear. Something playing on your mind, Phil? but I threw 130 quid into a settle. than Ilkla Moor bar tat. I'm a big fan of statement pieces of furniture. -You've got to make one. -Are you stuck? Come on, my love. Right, are you ready for me to play some serious catch-up? Barry Meade and Rita Kearsey. Before they start, let's see what Rita makes of their lots. The egg tureen, that's quite nice. I haven't seen that particular model before. and so hopefully we'll pick up some Beswick collectors. just because it's a very nice quality piece. I like the steam engine. so hopefully that will do well on the internet. and it's a busy one, with bidders in the room, online and on the phone. First up is Natasha's 1960s Beswick animal group piggy back. I'm looking for 20 for that one. Can I have at ten? 12. 14 bid. 16. Make it 18. Unlucky, Natasha, but plenty still to come in this auction. Shall we walk in again and just pretend that didn't happen? Yeah, that'd be nice. Yeah. which was fancied by auctioneer Rita. £40 for the sherry label. 40 I'm bid. Looking for 42. -Looking for 42 on the net. -44. At 42 on the internet. -Cheeky fox. You've got a net bidder. At 42. At 42. Looking for 44. 44 in the room. 46. 48. 46 on the net. Looking for 48. You all done? You all finished? That really isn't very expensive, that. A shock loss there for Phil. Not ouch. That's not an ouch situation. It's a gentle knee in the nether regions, isn't it? Can Natasha fair any better with her second bit of Beswick? This time it's a 1970s pheasant. Any advance on 20? I'll take 22. At 20 in the middle there. Selling at 20 in the middle. That's all right, but it could have done better. A profit's a profit and that's the first of the day. working model of a stationary engine? I've got interest on commission. Starts me at £24. At 26 now. Looking for 28. £28 now. Looking for 30. At £28. Looking for 30. You all done? At £28 you finish. Clearly there are no engine enthusiasts in the saleroom today. Will a spot of jewellery be more to their taste? It's Natasha's unmarked yellow metal seed pearl and coral brooch next. I think this will do well. This will do well. Can I see 20 for it? 20 I'm bid. On the net at 20. -At 22. At 20 now. Two online bidders. Looking for 24. Come on. The battle of the bidders. At 30 now. Looking for 32. -At 32. Make it 34 online. At 32. At 32. 34 now. Looking for 36. At £36. You all done? -That's a tiny little profit. -It deserved a bit more than that. It did deserve a bit more. Phil's turn again. Can his watercolour secure his first profit? 20 for it. 20 anyone? Someone start me at £10 for it. 10 I'm bid. Looking for 12. -That's a bit of a relief, really. Looking for 12. At 10. At £10. Are you all done? Talk about an unlucky street, but at least it wasn't a big loss. I just want you to know that I'm not warped or bitter in any way at all. Next up, Natasha's oversized carboy. Not a hand in sight. 20 I'm bid. on the net at £20. At £20 on the net. Are you all done? Selling at £20. I reckon you're about minus oomph pence for that. after auction costs are deducted. starts me on the internet at £32. At 34 now. Looking for 36. Selling on the net at £34. -You're absolutely right I will. Great little profit there for Phil. Wish I hadn't spent all that money on that settle. the modern British original oil painting. -Telephone bid on this item. -Can I see 20 for it? -Yes, you can. Go on. -At 20 on the phone. At 22. 24. Looking for 26. At £44 on the telephone. Are you all done at 44? Phil's big risk, the antique oak settle. Would someone like to start me at £100 for this? 60 I have. £60 online. Looking for 65 now. At 65. You coming back in, online? I'm going to sell then at £65. -You've got to laugh, haven't you? You've got to laugh cos, if you didn't, you'd cry. Someone's got a nice settle there for a great price - Lucky devil. Onwards and upwards, Phil. Shall we go? -I'm in no fit state. I need nurturing and looking after gently here. I might even need a darkened room. Come on, let me drive you home. Phil was down on his luck today, resulting in a loss of £108.94. But he's still got a healthy £166.96 to spend on the next leg. with £173.12 to play with. You're in a state of shock. I'm in a state of shock, but in a good way. In a good way, but I feel sorry for you. -Now, now, Philip, nobody likes a sore loser. That looks like serious oil paintings. I'm going to go this way. just in the middle of my shoulder blades? It's the second leg for antique hunters Philip Serrell and Natasha Raskin as they take in the delights of south west Wales before crossing into England and heading to an auction in Newent, Gloucestershire.